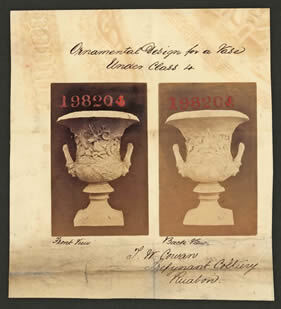 Ornamental Design for a vase under Class 4. Front View. Back View. T W Cowan, Trefynant Colliery, Ruabon. Ruabon is a small mining and industrial town near Wrexham in North Wales, close to the English/Welsh border. There are several examples in the Gallery of ceramic wares associated with other industrial operations, especially coal, iron and steel - see designs registered by the Coalbrookdale Company, 182472 and 195632, the Thompson Bros. Pottery of Hartshorne in South East Derbyshire, design 212054 and George Skey of Tamworth, Staffordshire, design 251030.